When Mike Fuller of Fulltone originally devised the OCD, he wanted an open-sounding distortion pedal with decent headroom to more faithfully emulate a driven tube amp. This desire for extra headroom is why the OCD can be run from anything from 9-18V, with the pedal delivering a noticeably different, less compressed sound when run at the higher voltage. 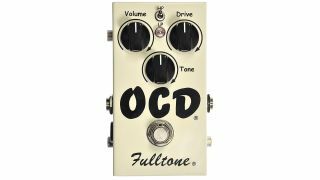 Although this has never been confirmed by Mike Fuller himself, the OCD takes its driving inspiration from a now little-known pedal partly descended from the Ibanez Tube Screamer. As can be discerned from looking at the schematics side-by-side, the original OCD is essentially a Voodoo Labs Overdrive, itself similar to a cascaded MXR Distortion+. Although the first version of the OCD featured an expoxied or ‘gooped’ board, later iterations would prove popular platforms for modding by the DIY community. There have been seven distinct versions of the OCD, identifiable by the PCBs and layout on the inside, alongside visual cues like the size of the logo on the front panel. The changes on the versions between 1.1 and 1.7 are relatively subtle, and are mainly component value tweaks to slightly alter the EQ response. The most interesting change is on version 1.3 - increasing the drive pot to 1M for more sustain, and the addition around 1.4 of a germanium clipping diode. The leap that was made with version 2 brought even more dramatic change. The three key differences are a new output buffer, a discrete 2N5457 JFET transistor input stage, which raises the input impedance significantly - as you’d find on an Echoplex or Space Echo preamp - and the option to use a new type of switching, called enhanced bypass, instead of true bypass. The clipping waveform distortion on the OCD is delivered by two 2N7000 transistors after the first stage, with the Drive control determining how much the signal is amplified before it hits this point. After the first version, the drive pot had its value bumped for more dramatic distortion, and on later iterations of the pedal an asymmetric 1N34 germanium diode was controversially added to more dramatically shift the character of the clipping. In the DIY community, the pre-germanium version remains more popular to build. The tone control is essentially a treble roll-off. Although a fair bit of treble is filtered at the main amplification stage, the tone control is used to remove treble above a fixed frequency right before the output of the pedal. The HP/LP switch isn’t a high-pass, low-pass selector as the abbreviations imply, but instead selects between different frequencies to use at the shelving frequency for the Tone control. For most players, guitars and pickup combinations, the HP, or higher, frequency should be the better option, but like most things it’s about personal taste. One of the characteristic elements of the OCD’s clipping is that, when run at 9V, much of the clipping comes from the op-amp itself. The EHX Glove resolves this with an internal charge pump, which bumps the circuit internally from 9V to 18V, from the ‘Super OCD’ modded OCD designed by Fred Briggs. Sadly, it doesn’t include Fred’s additions of a dedicated bass or higher-quality op-amp, but it’s still a great-sounding drive. Small but perfectly formed, this diminutive and affordable pedal is allegedly a direct clone of the OCD. However, if we were judging the Mooer Hustle Drive by the lower-gain sounds on offer, it would more accurately be described as a clone of the original version of the pedal, before the gain potentiometer was bumped up in value, though it is possible that this might just be our ears playing tricks on us. At this price though, it’s worth taking the punt. It may look an aesthetic atrocity, but beyond the gross exterior, the Joyo Ultimate Drive is a clear descendant; in fact, an OCD version 1.4 clone with slight component tweaks. Interestingly, for the first few years of manufacture, the germanium diode was incorrectly oriented, meaning the pedal had a sound all of its own. This was later corrected, returning it closer to the sound of the original. Into a clean Marshall-style amp you can get some dark rhythm sounds with a neck pickup and this setting. Increase the tone at the pedal, and roll off at the guitar and you get some Billy Howerdel-style mid-2000s rhythm tones too. With a humbucking guitar in the bridge position, start with this setting for some classic, powerful leads. With a hotter amp, pull back the volume as required. Try running the pedal at 9V in order to get some pre-amp compression, then adjust tone and drive to tame the highs as required. Depending on your amp, you might have to tweak the volume and gain slightly, but this is a good starting point for experimenting with darker, thumpier blues tones. Particularly when run at the higher voltage, a neck single coil will really sing when given just a bit of hair by the OCD.